Later that evening, at 9:23 pm, a magnitude 2.9 event occurred about 7 miles SSW of Kachina Village. 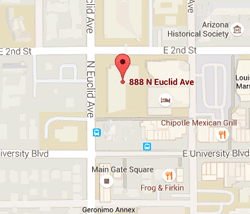 This could be another aftershock to last November's M=4.8 earthquake between Flagstaff and Sedona. The region from around Flagstaff to Grand Canyon is the most seismically active in the state. The University of Arizona Global Initiatives group is working with UA Mining & Geological Engineering to host a 3-hour symposium on Mineral Resources: from Exploration to Environmentally Sustainable Mining in the SW United States and NW Mexico. It will be held Monday, September 28, 2015,09:00 to 12:00. 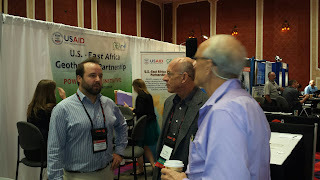 We're in the last day of the Geothermal Resources Council annual meeting in Reno, with an exhibit booth in the Geothermal Energy Association's Expo, giving demonstrations of the National Geothermal Data System (www.geothermaldata.org). AZGS manages the NGDS on behalf of the rest of the state geological surveys, with 65+ data providers in all 50 states contributing over 10 million data records currently. Any geothermal energy project funded by the US Dept. 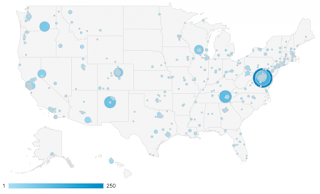 of Energy has to make their data publicly available through the NGDS. 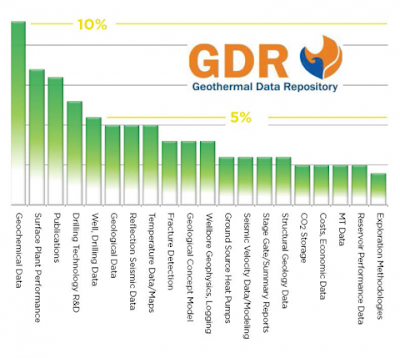 Most projects chose to send their data to the Geothermal Data Repository node on NGDS. GDR is run by the National Renewable Energy Lab in Colorado. They are looking for any and all geoscience images featuring your internships, research, or geoscience work as a whole. 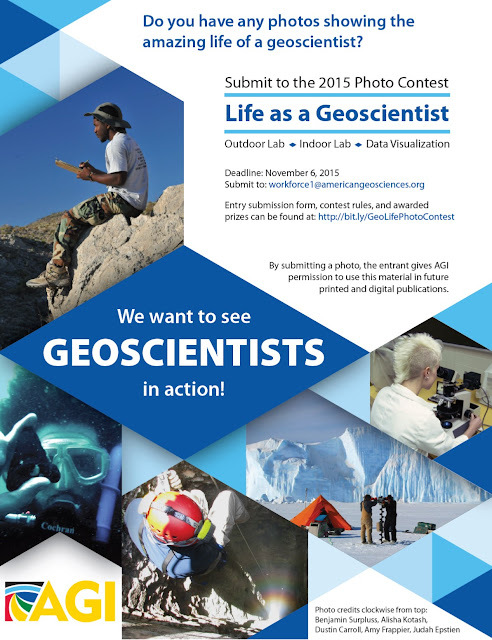 Photos can be entered into three different categories: Outdoor Lab, Indoor Lab, and Data Visualization. They "want your best photos showing what geoscience work and research looks like and why you love being a geoscientist. Submitting epic photos allows participants the opportunity to win prizes." The Arizona Department of Environmental Quality (ADEQ) announced it now has available through its website an online search engine allowing faster, more direct access to the agency’s 19 environmental databases containing information such as a facility’s operating permits and compliance history. Known as MegaSearch (http://megasearch.azdeq.gov/megasearch/), the tool allows customers to enter search criteria such as a facility’s name and address or its unique ADEQ file number to view a list of relevant environmental records and files of interest. Once identified, the files may be selected from the results page and emailed to the ADEQ Records Center for retrieval and viewing. By conducting their own independent research, customers can save time by eliminating the need to wait for results from a traditional records request with the help of Records Center staff. “MegaSearch helps prospective land and business owners or anyone who wants to see instantly what environmental activity has been reported for a given location,” ADEQ Records Manager Eric Flohr said. For example, Flohr said if you previously had wanted to know if a nearby gas station had a history of leaking underground storage tanks, you would have contacted ADEQ to submit a research request. Staff would then have accessed these same databases now available online to see what records of activity had occurred at the site. The process could take several days depending on the number of pending research requests, he said. “Tools like MegaSearch give customers direct and instantaneous access to ADEQ’s vast amounts of environmental data from all over the state, which supports more transparent government for our citizens,” Flohr said. For questions about MegaSearch, please contact Eric Flohr at (602) 771-4335 or by email at jef@azdeq.gov. We will have an exhibit booth at the Geothermal Resources Council annual meeting in Reno next week to demonstrate the system to the geothermal industry.